Today I'm linking up with Beautiful Books, an alternate of the usual Beautiful People hosted by Cait @ Paper Fury and Sky @ Further Up and Further In. Writers answer questions about their book, and today, I get to introduce my NaNo novel! 8 people favorited said Tweet (thanks lovelies! ), so I took that to mean THE ENTIRE WORLD LOVES IT and set out to write it. More than that, the idea of commercialised magic has always been one of my Tumblr-inspired writing ideas. I admit I'm unfamiliar with writing urban fantasy, but hey, nothing can go wrong. It's MULAN AND SWAN LAKE. Because (1) MULAN (2) Swan. Lake. C'mon. (3) 80% girl cast (4) magical Starbucks (5) I call it VICIOUS meets THE NIGHT CIRCUS and I love those two books far too much for my own sanity. My inability to be coherent answers this question quite adequately, I think. Oh right, I haven't mentioned the title yet. It's titled WITCHES BLACK AND SILVER. It's a Mulan/Swan Lake retelling, set in war-torn Hong Kong. Huh, what if I included a screenshot of my character descriptions? I mean, Cait herself is the chief advocate of rebelling in link-ups. ... Never mind. Mo is basically my threatening devilish side who likes maths, and Mak is my petty jealous competitive side. While I'm going to love them both, my favourite will be the Huntress, also called Yi. She's a deaf assassin who used to be friends with Mak but is now charged with hunting her down. She's the antagonist, to no one's surprise. Grave-robber Mo stumbles upon a cursed locket that gives her the appearance of the northern princess by day and a swan's form by night. To break the curse, she must return the locket to its owner. But monsters prowl the northern lands, and Mo must survive both witches and witch-hunters on her journey. It's set in a futuristic, very dark Hong Kong. Later our stage shifts to the slightly less war-torn magical north, with magical Starbucks and other commercial magical places. I haven't actually got photos, but a similar vibe to the Pinterest board. 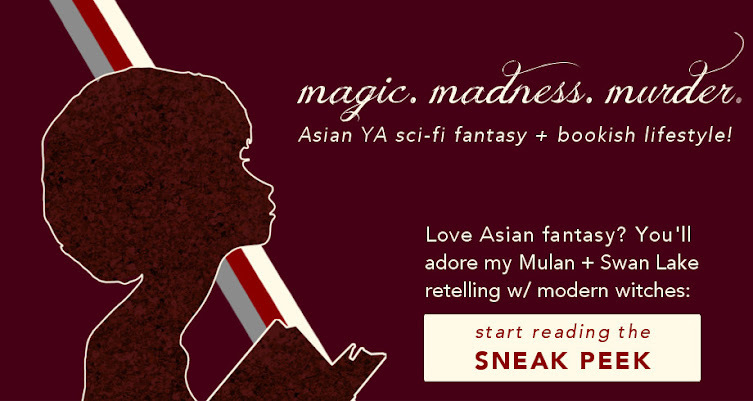 Because, after all, it's a Mulan retelling, Mo's major motivation is her family. But because they don't factor much into the plot, I'm instead going to talk about the Mak/Huntress relationship. Basically, the two used to be friends until the Huntress got better at magic than Mak. Being a reasonable princess, Mak more or less banished Huntress and the Huntress ended up enslaved to the enemy prince. It goes downhill from there as they're pitted against each other in a war. I haven't decided on a character development arc, actually. But Mo will definitely have to come to terms with her loose morals and looser knives, while Mak has to deal with her breakup with the Huntress. I actually deal with a lot of themes. War and its awkward moral standards, rivalry and competitiveness, deception and disguises, friendship. And because of the diversity, we also have some thoughts on ableism and body shaming. How I want people to feel? This was basically what I thought my two comp titles, VICIOUS and THE NIGHT CIRCUS, did to me. They wrecked my feels and I fell in love with them. Sparse drafting. You have got to leave blanks and let imperfections be. Hole yourself up and ignore other pesky humans and responsibilities. It's hard to write so much so quickly. Mermaid tears and ground unicorn horn. I SWEAR by these two. Interested in this Mulan/Swan Lake retelling? Join my takeout army today; I'll be sending out the first paragraphs out to them by the end of NaNo! So, blookunity*: what do you think of Witches Black and Silver? Oh, and do leave a link if you're in Beautiful Books! *I'm serious about this. You should just submit to my whims.